HDTV Supplys WolfPack 1X2 HDMI to CAT5 Splitter allows you to send both an HDMI audio and an HDMI video signal from one end of a room to the other or one floor to another with standard, inexpensive and reliable CAT5e or CAT6 cables and distribute out to different rooms. See the above 1X2 HDMI to CAT-5 Splitter front and back pictures. This WolfPack 1X2 HDMI to CAT5 Splitter is an HDMI splitter with two RJ45 outputs. It distributes the input of the HDMI signal into the two identical outputs simultaneously. Two supplied HDMI Receivers by Cat5 receive the distributed signal from the splitter and transmit to displays individually. Also, the transmission distance is 125 feet even for a 1920x1200 resolution and also 125 feet for 5.1CH or 7.1CH audio. Straight cable runs with no electrical interference, bends, kinks, patch panels need to provided. Allows you to send 1 HDMI audio and video source device to 2 HDMI equipped devices. The picture will be the same on both HDTV′s. Supports HD resolutions up to 1080p at a range of ~100 feet. NOTE 1: The two CAT-5 to HDMI receivers are included that install at the TV end. AC adapters come with them that must be plugged in to an AC outlet. The expense of running thick, heavy, obtrusive HDMI cables over extended runs can also blow your budget. This 1X2 HDMI to CAT-5 Splitter allows you to connect all your displays back to a central system using reliable, cost effective CAT 5 or 6 cabling and keep HDMI connections to the hub short saving you money and increasing reliability. This 1X2 HDMI splitter over one CAT5 cable can be cascaded to achieve more outputs. The WolfPack 1X2 HDMI to CAT5 Splitter is HDCP compatible; however, you must verify your source and destination devices support (or don′t support) HDCP encryption. Essentially, HDCP compliant devices will only transmit to or receive from other devices with HDCP coding. This HDMI splitter will also work if neither device is HDCP compatible. This 1X2 HDMI to CAT-5 Splitter includes 2 - CAT5 to HDMI receivers to be placed remotely at the HDTV′s, etc. Why not buy this 1X2 HDMI to CAT5 Splitter today? Control the TVs from where the source is via IR. 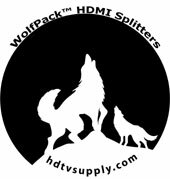 HDTV Supply has this WolfPack in stock in our California warehouse so place your order at the above ADD TO CART button by 11AM PST and it can ship today or call us at 800-841-9238 to place your order. HDTV Supply includes a 1 Year Limited Warranty on this 1X2 HDMI to CAT-5 Splitter. The warranty states that (a) its products will perform substantially in accordance with the accompanying written materials for a period of 1 year from the date of receipt and (b) that the 1X2 HDMI to CAT-5 Splitter will be free from defects in materials & workmanship under normal use & service for a period of 1 year. In order to get a warranty replacement for a defective item, HDTV Supplys Support Team will verify the product is eligible for warranty. An RMA number will then be issued. Shipped replacements will be in like new conditions, tested and all components included. HDTV Supply also sells a 3 and 5 Year Extended Warranty for this 1X2 HDMI to CAT-5 Splitter. Please go to Extended Warranties or see the above Options to purchase it.